the best brand name equipment you need! Enjoy the outdoors with all the comforts of home. If you want to slip undercover, we've got you covered! pick out some great gear! Enjoy summer out on the lake. 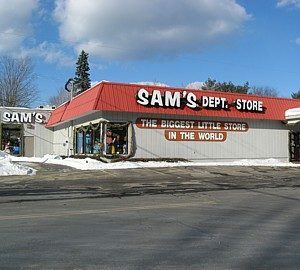 At Sam’s, we are proud of the relaxed and pleasant atmosphere we offer our customers. We are especially proud of the extremely knowledgeable and helpful sales associates you will find in every department. Enjoy summer out on the lake. Imagine paddling across the lake in a canoe, stopping to fish or just soak up the sun. Whether it’s a raging river or a serene lake, come to Sam’s to find the perfect Kayak for your long days on the water. It is your home away from home. Enjoy camping this summer with a tent from Sam’s Outdoor Outfitters. Enjoy the outdoors with all of the comforts of home. Lounge in the yard or travel to exotic locales and bring your furniture with you! It’s summer and that means that it is time to play. We carry games by Zume, Discraft, Innova & Pocket Disc. Have a fun filled family evening playing Badminton, Volleyball, Tetherball, Bocce, Croquet or Horseshoes with Regent Games. Enjoy a walk through the serene snow covered hills. 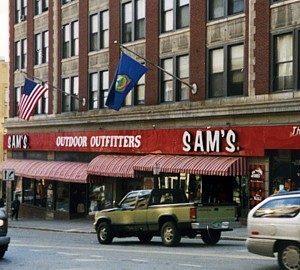 Sam’s offers Snowshoes from Tubbs, Atlas and MSR. Let us prepare you for those long walks through a winter wonderland. Fly down the snow covered hills in a Paricon Sled or a Tobbogan. We keep up with the latest fashion trends, as well as continue to provide the great classics you depend on. Come outfit yourself for your next adventure. We offer a selection of kids’ clothing designed to keep kids outside exploring all year long. Sam’s shoe department carries one of the largest selections of high quality family footwear in the entire Northeast! From fashion to function, we have the right shoe for you! We only carry the finest name brands at reasonable prices. The crisp air, the early mornings, is it hunting season already? Sam’s has the fire arms to help you bag that trophy this season. Looking for the perfect shot? Come to Sam’s to find ammunition by Remington, Hornady and CCI. Want to catch that elusive big fish this year? We carry Berkley, Rapala, Storm, Mepps and more. Catch the record breaking fish with Rod’s and Reels by Shimano, Shakespeare, Redington, Eagle Claw and more. Love the Outdoors? Can’t wait to get outside to camp, hike, kayak or snowshoe? 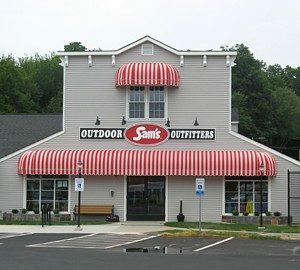 Then Sam’s Outdoor Outfitters is the place for you. If you like shopping at Sam’s you’ll love working at Sam’s.